Jazz Jazba now introduces daily unlimited internet service with no limits on internet usage. Now you can use daily unlimited internet on you Jazz Jazba connection with no data limit in Rs. 9.99 per day. 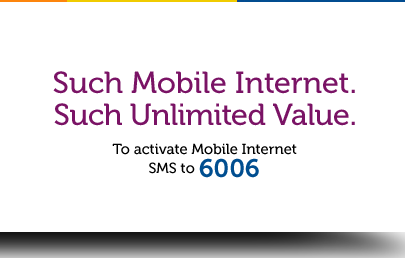 Send an SMS to 6006 to activate Mobile Internet. Mobile Internet will be activated after 24 hours. No activation required for existing Mobile Internet subscribers. Subscribers will be charged Rs. 9.99 on the day they use the Mobile Internet. Unlimited usage with no time limits. Internet charges will be deducted at day end. This offer is only valid for JAZZ & Jazba customers. WHAT ABOUT SPEED.IS IT WORKING EGPRS WITH MINIMUM SPEED 512Kb/s. ZONG OFFERING UMLIMITED @ 200/MONTH BUT IS IS TOO SLOW. Bro Zong is offering 2GB Package for Rs.200. It’s not unlimited. Even EDGE doesn’t support more than 384Kbps, why would you expect 512Kbps ? Dear, this daily package by mobilink is also not unlimited, 1GB usage limit/day. Yes Zong and Ufone are too slow mobile internet service providers. plz tell me how to unsub. best offer. But mobilink doesn’t have edge facility. Mobilink do have edge facility they also do have a service called flash which is even higher data rates than edge. Not sure they are providing edge on this service. However most likely they are providing it, wherever they have edge they provide normally when they talk of GPRS. waoooo nice move by Jazz…. but can you confirmed plz once we activate this service we will charged every day 9.9 rs even we didn’t use internet…? If you use Internet any day for any time, you will be charged Rs.9.99. The previous per kb charging isn’t valid anymore. Mobilink introduced GPRS pkg for Prepaid customers?? Really appreciable and Mobilink come-up like BIG-BANG..!! All in all, Its outstanding, Unbeatable and what more to say…. Its amazing yaarrrr!! So for someone looking a good GPRS package for their smartphone, which service/package do you guys recommend? I want at least 1 GB per month. So far the cheapest and most cost effective/suitable was 2GB GPRS package by Zong for Rs.200. Is this Jazz Jazba package better? I currently have ufone and I will be switching to another network based on the best GPRS package, as ufone’s 1.5GB package costs too much (Rs.500). GPRS and EDGE speed isn’t that good but with Jazz’s this offer, you cna get unlimited Internet per day for Rs.9.99 PER DAY or Rs.300 per month. So does this offer mean than even if we consume 100 Kb worth of data in a certain day, we will be charged Rs.10? And for the whole month (unlimited) the charges will be Rs.300? jab zong 2gb @200/month with edge servis dey raha hai to phir jazz ka slow gprs @300/month q ? Why doesn’t ufone introduce a better package for GPRS? By reading the comments, in speed terms, ufone is the best? bhai telenor ki speed achi isliye hy because un k servers pe users bht kam hain jab zyada log use kren ge to wo b slow ho jaye ga ! week end package of moblink is a fraud package i subscribed this package for Rs.30/a confirmation message also send to me by moblink but when i called to my friends my balance was lapsed and on a complaint to moblink i was told that it happend mistakenly . who is responsable for that mistake? i suggest to all plz beaware of such packages,keep ur balance Rs.000/ before u call under any package. it’s the best package from mobilink.i will preffered it on zong 2gb. Lol Zong is giving unlimted in 200 per month while its wil cost u 358 per month so y to prefer jazz ? Yeah, nice. Many months ago mobilink were giving free internet to every costumer. There was no cutting. I think mobilink was testing its service. I used free jazz net many of GBs..but net was blocked a week ago. Now its back again with good rates. Im agree to pay 9.99/day for net. Ufone walo kuch karo, give atleast 1gb package for Rs.150. I and a lot of others r going 2 put their jazz sim again after a very long period. That’s high too, We can consume 1 GB a day in Rs. 10 with Mobilink. Please also mention that this package has been automatically activated on jazz numbers. I have 3 jazz numbers in my home and internet usage on them is minimal. Why then do i have to pat rs. 10 every day? also i caleld 111 and asked for deactivation of this package which i was told will be done in 2 hours. I called today after 24 hours and i was told that there was a system error and my package is still active – yes, its activte on all three numebrs – like yesterday i wasted another half an hour on 111 and asked them to deactivate it. lets see what happens now. 1. wasted abt 1 hour of my time trying for deactvation. And im just talking about 3 customers here, mobilink has over 30 million. imagine the profits they will make by playing dirty!! Mobilink does support for EDGE services for for selected cities. i.e. LHR, ISB, KHI, FSD etc.. In terms of speed limits, Mobilink supports Max. Speed in EDGE areas varies from 10kbps to 21kbps where as in ordinary GPRS areas speed varies from 4kbps to 9kbps! I hope this may help many ppl to understand GPRS speed limits in Mobilink. Source: My Uncle is Sales & Service Manager in Mobilink GSM – (ISB) Pakistan, He told me abt this all. You don’t get charged till you use the internet on that day!! Plus the offer was launched today and it says that you will be charged after the day ends so it is strange that you got charged already. Are you sure you are not posting because you work for some operator?? the amount will be deducted tomorrow for today’s use, the 111 rep confirmed that. no im not posting because of any other reason but the fact that i am a customer and i have a couple more customers in my home who are dependent on me to activate/deactive services and to get knowledge everytime there is an sms from mobilink. i hope mobilink this internet package will bring a new competition among the mobiles service provider. — Internet charges will be deducted at day end. Does that mean if you activate at 11pm you will be charged in one hour? Too bad it is not activation for 24 hours instead of activation for rest of day. Try waging your tail in front of them like you do here at other people’s comments and they ight do somethign for you. jazz internet daily package is fraud pckge. customer should go into the consumer court for damages against mobilink. a very good package from mobilink but mobilink has very poor service and in many rural areas they have not gprs service like in my village. Telenor is best but it should reduce rates. So far service is good. I tested Skype call using mobilink, it was good..
and according to my knowledge charges are only for usage. So you can delete GPRS Settings to avoid charges.. I am wandering…on GPRS/EDGE, how much speed users will be getting? Unfortunately, that way Pakistan Telecom sector was growing, it is badly struggling since start of so called Democratic rulers. We were quite ahead in technology few years back…then stagnancy, rather down-turn started. Imagine, majority of nations are enjoying 3G and bandwidth speed of 27MBPS etc… here telecom companies are busy in making people fool by providing depleted technology “Edge/GPRS” and charging enormously…above this Government is enjoying huge collection of taxes approximately 32%+. What is future of telecom unless they are not allowed to bring world’s best bandwidth on mobiles. Now telcom is not a name of proving calling service…it is bundle of high speed data and calling service. How people can enjoy true experience of Smart Phones with this pathetic Edge/GPRS service available only. PTA should stop ____ people and take sensible steps. Ufone is the best, but their charges r very high. Especialy their sms package charges. They r offering weekly sms package only on uth package, ufone walo kuch khas karo. No you are not right! I am using it from 4 pm till now its more then 20 mb now and still activated using opera mini. mere khayal me zong ki service sub se achi service hai baqi sub network wale fozol batain karte hain mobilink wale aj bhi porane system pe chal rahe hain iska andaza es bat se lagaya ja sakta hai k jo 24 hours lete hain package active karne me wo kitne fast honge har koyi samjh sakta hai jo package zong wale 24/sec me active karte hain wo bat 24/hr me bhi mobilink wale shayad kar sakain. Khair apni apni pasand hai. v have mobilink edge here in gilgit..speed 10KBps to 26KBps..comparable to zong edge..
No jazz offer is boring , ap ko ye nai pta kya zong offering daily mobile internet at rs.5/day its amazing. I just use zong and also i use zong 2gb pkg. Its amazing pkgz by zong..! And telenor is second after zong. Zong is the no.1 for mobile internet. Sb se pehle zong ne hi to mobile internet k pkgz introduce kiye the bhool gaye saare? In terms of speed, Telenor’s internet is best of all. I am using Telenor internet more which is very fast compared to the internet speed of other networks. Kya Kisi ka Mobilink free internet chal raha hai ? yes of course, men net blkl free use kr rha hn jazz pe, app b download hoti hain, pictures or songs audio video b lakin streaming nae hoti! Boht zbrdas pakge hay, lakin speed nai hay m0blink ki. be positive yar! At least data packages ka competetion to shuru ho gya. Specially mobilink jesa operator agr unlimited offer de skta hai tou why Ufon and telenor can’t do so? I dont think that 2mb data daily bucket is enough and specially for high end smartphones it means nothing. You have to activate again and again your so called data bucket and moreover with Ufone you are bound to use your bucket just once in a day. In terms of data usage and price tag Zong is best of all but speed is something that will always test your courage. I dont say that only zong have speed problem, all of the operators doing so pathetic in this regard. Telenor has slightly good speed but it doesnt any good data package, as i already mentioned that 2 or 3 mbs mean nothing for a smartphone. About this offer i would say that its a good begining of a new data based competetion. Jazz is rocking again but need to update its data reate. Same thng hapnd as I said before! Mobilink using slogan “UNLIMITED STREAMING, DOWNLOADS etc.” for its GPRS ad campaign. I’m using this pkg since its launch date but still now I’m unable to stream any video frm any site incl. Youtube! Further, downloads? huh, even a wallpapers is not downloadable using Mobilink GPRS! It not more than a Bullsh*t.
In short, we pay Rs.9.99+tax/day for surfing, nthng else! you can also watch live tv in this offer..